Android OS, as the mainstream operating system, has been widely applied to a variety of mobile phones and tablet computers. In the mobile phone market, many hot brands are running Android OS such as Samsung, HTC, Motorola, LG, Sony and more. With the expansion of the user base, data recovery has become a matter of growing concern. As I know that, many Android users feel depressed on account of unexpected contact and message loss. Contacts and messages may get lost after you wipe your phone or switch a new one. Sometimes accidentally pressed the wrong button will also make your data disappear. There is no doubt that contacts and messages are very private and important to us, but how can we retrieve lost data from Android device without backup? In fact, when you mistakenly deleted or lost data, the file system does not remove them completely. If you put your Android into some professional Android data recovery applications in time, you can restore the missing contacts and messages without any loss. 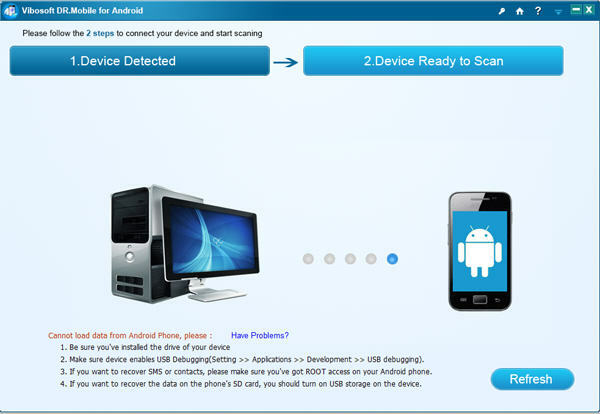 Here I would recommend to all of Android users is, Vibosoft DR. Mobile for Android, a leading Android data recovery tool. Vibosoft studio has made a major breakthrough in the field of Android data recovery. With regard to Android SMS, contacts accidentally deleted, it can provide comprehensive recovery solution. In addition, it can retrieve other Android data like photo, music, movies and more with simple operations. Make sure you have installed the driver or it will automatically install it on you device. Plug your Android device into computer and run the program. Enable USB debugging: Setting –Application—Development–USB debugging. Choose “USB debugging opened” and click “Refresh” button on the program. After scanning, all your data will be displayed on the left list, well-organized as contacts, messages, photos, etc. You can preview details of found data by pressing each item. Select the files you needed and click “Recovery” button to get them back on your computer. If you have Vibosoft DR. 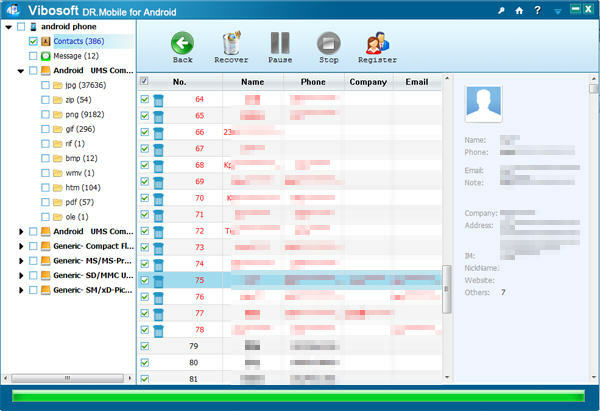 Mobile for Android in hand, you will be relieved of any data loss from your Android phones and tables. And this program is well-known for its high compatibility. All kinds of brands who run Android OS can access it smoothly. Thanks for sharing this review. Will surely give a try. Nice review. I have already used this software and I must say that it is really a good app for taking backup from android. I think it´s really interesting.